Maestro John Zoltek introduces the music to the audience at the January Gershwin Gala. KALISPELL — Glacier Symphony’s board president, Julie Moffitt, announces that a dollar-for-dollar match campaign that was initiated in October has yielded successful results. “One of our very generous, anonymous donors offered to match new donations from our patrons, collected in the last quarter of 2018, up to a total amount of $10,000. We are pleased to announce that we were able to reach the $10,000 goal, and we actually surpassed it by over $4,000. This excellent result was the accomplished by a true ‘team effort’ made by our fans, our staff, our donors, and our community. We are all thankful for this lovely demonstration of generosity and support,” Moffitt enthused. 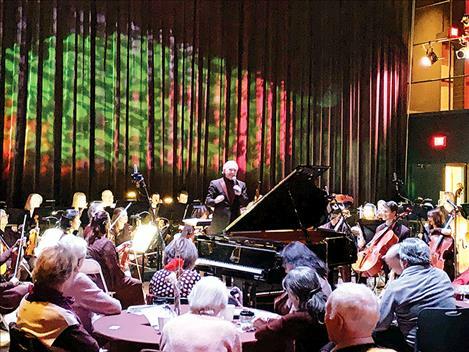 She noted that the funds will be used to support musical programming and other organizational initiatives for the upcoming spring and summer concert season including the next concert, “Sheherazade: Romancing the Soul” on Sunday, Feb. 17. This concert features the symphony orchestra, and pianist Andrew Staupe performing Chopin’s Piano Concerto No. 1. The 2018-19 season will be capped by a Symphony-Chorale Spring Festival on April 26-28, offering three distinct concerts showcasing the orchestra and chorale. Moffitt added that music director, John Zoltek, is now selecting dynamic and varied musical programs for the summer season, including “Symphony Night at the Farm,” two outdoor concert parties for the entire community, and the week-long Festival Amadeus to be held in Whitefish. “The goal of the Glacier Symphony board is to build wider audiences for symphonic, pops and special music events, while giving back through the outreach programs, such as our Youth Music Experience, in which guest artist Andrew Staupe will perform in February,” she continued. The program offers a free concert for children in grades five to six and homeschool children throughout the Flathead Valley. “As the population of the Flathead Valley expands we want our strong music community to be an essential part of that growth,” Moffitt said. “Our last four concerts were “sold out,” so I encourage everyone to arrange for your seats for the remaining performances,” she concludes. To learn more about the Glacier Symphony, orchestra and chorale and how to become part of it visit: www.glaciersymphony.org or call 406-407-7000.